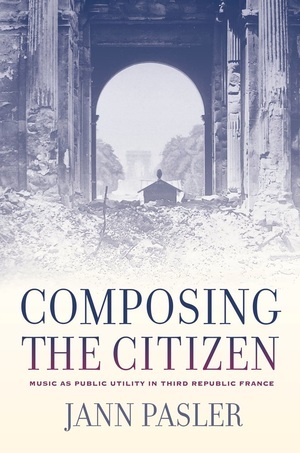 In a book that challenges modernist ideas about the value and role of music in Western society, Composing the Citizen demonstrates how music can help forge a nation. Deftly exploring the history of Third Republic France, Jann Pasler shows how French people from all classes and political persuasions looked to music to revitalize the country after the turbulent crises of 1871. Embraced not as a luxury but for its "public utility," music became an object of public policy as integral to modern life as power and water, a way to teach critical judgment and inspire national pride. It helped people to forget the past, voice conflicting aspirations, and imagine a shared future. Based on a dazzling survey of archival material, Pasler's rich interdisciplinary work looks beyond elites and the histories their agendas have dominated to open new windows onto the musical tastes and practices of amateurs as well as professionals. A fascinating history of the period emerges, one rooted in political realities and the productive tensions between the political and the aesthetic. Highly evocative and deeply humanistic, Composing the Citizen ignites broad debates about music's role in democracy and its meaning in our lives. Jann Pasler is Professor of Music at the University of California, San Diego. Among her books is Confronting Stravinsky: Man, Musician, and Modernist (UC Press) and Writing through Music: Essays on Music, Culture, and Politics.